America’s Roofing & Spray Foam, LLC has been providing top-quality roofing services to the residents of Santa Fe, NM for more than 12 years. Our main goal is achieving total customer satisfaction. Our team of highly-professional and highly-trained roofing contractors are happy to work on your next project. The fact that we are dedicated to providing nothing less than impeccable results in order to exceed the expectations of our customers is what makes us a premier roofing contractor. We also strive to achieve a relationship with our clients that has professionalism, friendship, and trust in its core. I noticed that there is something wrong with my roof when it was a little too late. So, I needed a professional roofing contractor who can fix it quickly and properly. I am very glad that I found out about this company on Google. They repaired the roof quickly, and they work at competitive rates. I recommend them! Thank you America’s Roofing & Spray Foam LLC for the professional roofing service! I’m really impressed by your professionalism! Keep up the good work! Instead of delaying the repair of your roof, schedule an appointment for our services by either filling out the form below, or giving us a call at 505-474-6323. We’re available to our customers Monday through Friday from 8 a.m. to 5 p.m. and even on Saturday from 8 a.m. to 12.30 p.m. For our client’s convenience, we accept various methods of payment, including MasterCard, Visa, checks and cash. Our roofing company is fully-licensed, bonded and insured and you can call for emergency situations Trust in our professionalism and choose the best commercial roofing contractor in Santa Fe, NM! 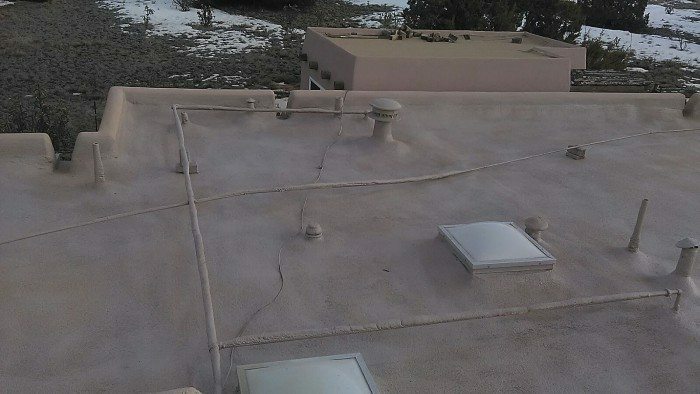 America’s Roofing and Spray Foam is a roofing company serving clients in Santa Fe, Taos, Los Alamos, Farmington, Tesuque, White Rock, Hobbs, Española.